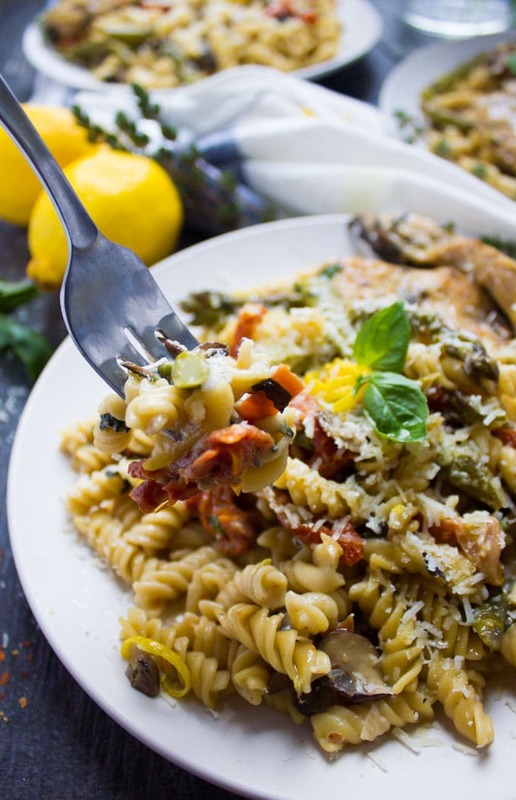 This quick, One-Pot Chicken Pasta Dinner is loaded with fresh veggies and packs a good serving of protein from the succulent chicken. The best part: it comes together in just 10 minutes of cooking time! Today’s delicious recipe is sponsored by Save on Energy—Ontario’s go-to source for energy efficiency! All thoughts and opinions are mine alone. Get to know how you can make use of energy-efficiency programs/incentives for home and business, making it easier than ever for Ontarians to manage their electricity use. 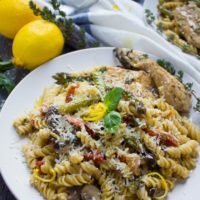 If you’re like me and can’t resist a big bowl of pure, creamy, delicious pasta comfort, I can almost guarantee this one-pot chicken pasta will become one of your favorite recipes! This one-pot recipe is all about simplicity and time-saving, so I can’t help but mention energy- saving benefits. 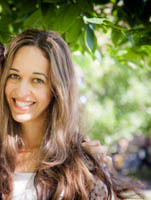 These days, it seems like we all track our food intake, but we rarely track the energy consumed when cooking. This can result in habitually leaving the fridge door open. Or powering your oven or stovetop beyond the required time, and cooking elaborate meals that use multiple appliances. 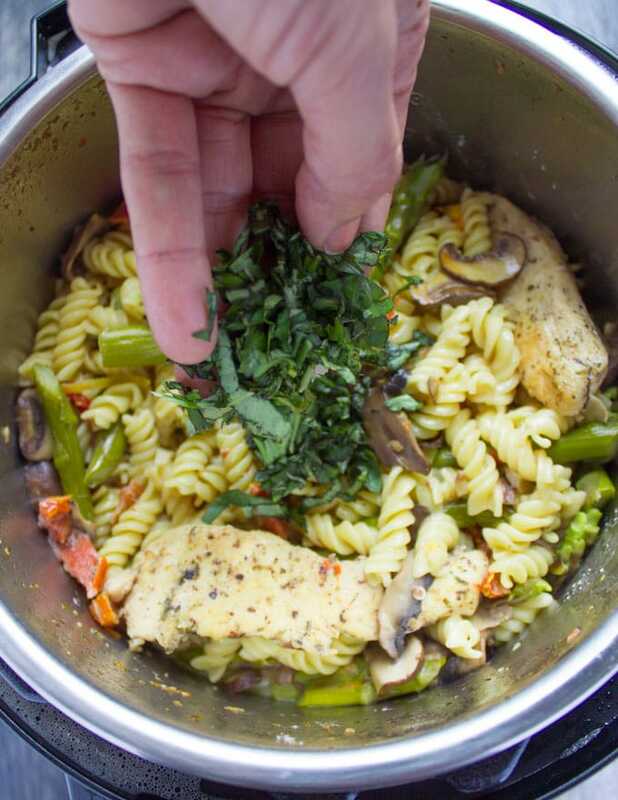 There’s plenty of ways to save energy in the kitchen, like keeping pot lids on to reduce cooking time, using Energy-Star appliances, or trying an easy one-pot chicken pasta recipe! I’m making a conscious effort to cut back on energy use in the kitchen, and this one-pot (pressure cooker) recipe is my new go-to. 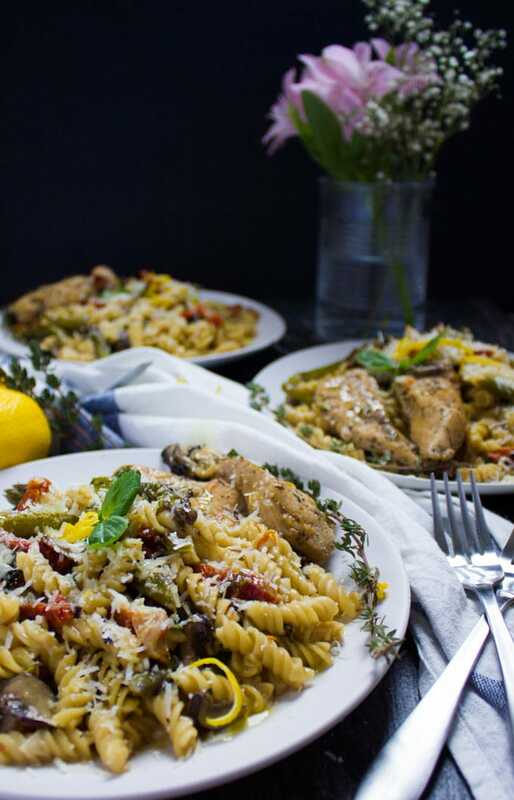 My (second) favorite thing about this creamy one-pot chicken pasta is that it’s completely versatile. For my happy comfort pasta plate, I’ve got asparagus, mushrooms, sundried tomatoes and seared chicken. You can go for broccoli, corn, extra cheese, fresh tomatoes, and even more, you can swap the chicken for shrimp. Now, we’re making this a one-pot meal. 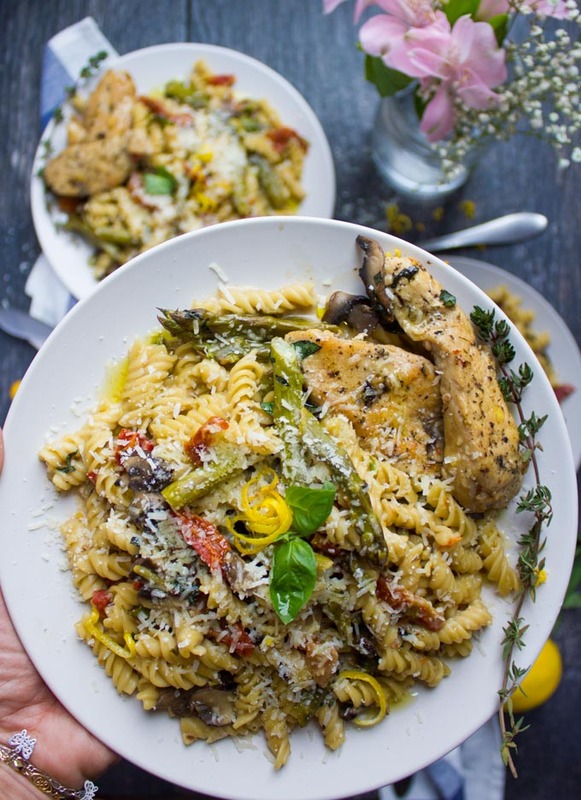 So depending on the size of your chicken strips and, the type/size of pasta you’re using, this recipe takes anywhere from 10-14 minutes, start to finish. How amazing is that?! It’s quick, delicious, healthy and saves your monthly energy bill. 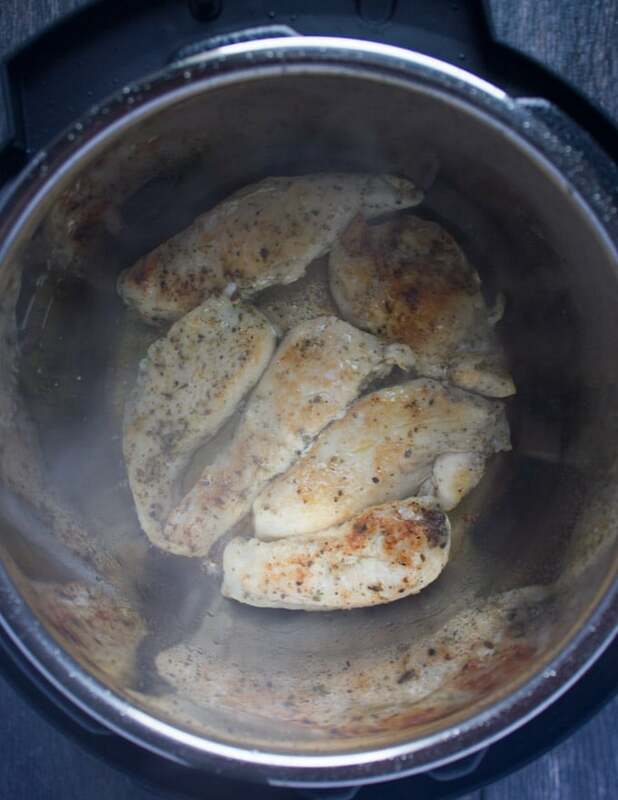 You’ll start by seasoning the chicken strips with salt, pepper, garlic powder, and oregano. Then sear it in a pot or even better, in an instant pot or pressure cooker like I did today. 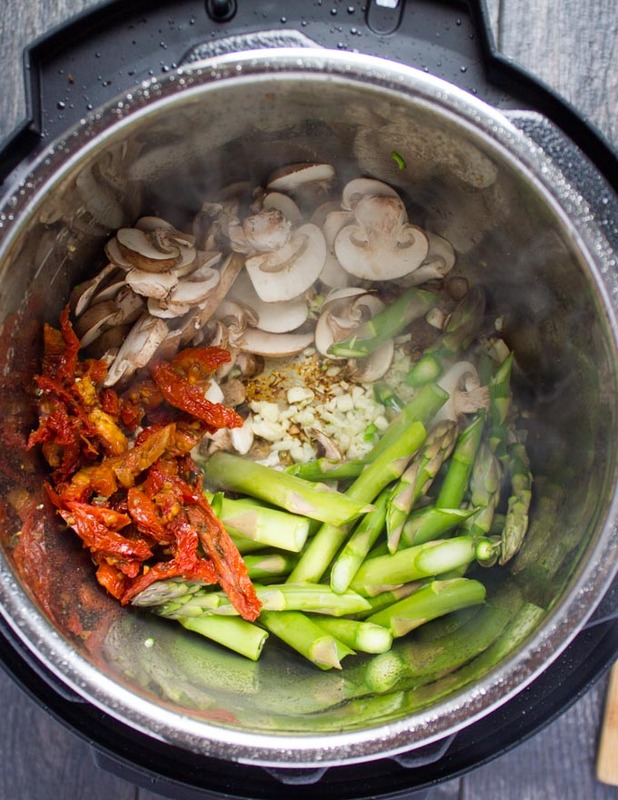 While it’s searing, chop up your veggies—mushrooms, asparagus, and sun-dried tomatoes. The chicken sears for 2 minutes per side at most so it won’t be cooked through. You basically want a nice sear to seal in all the chicken juices. 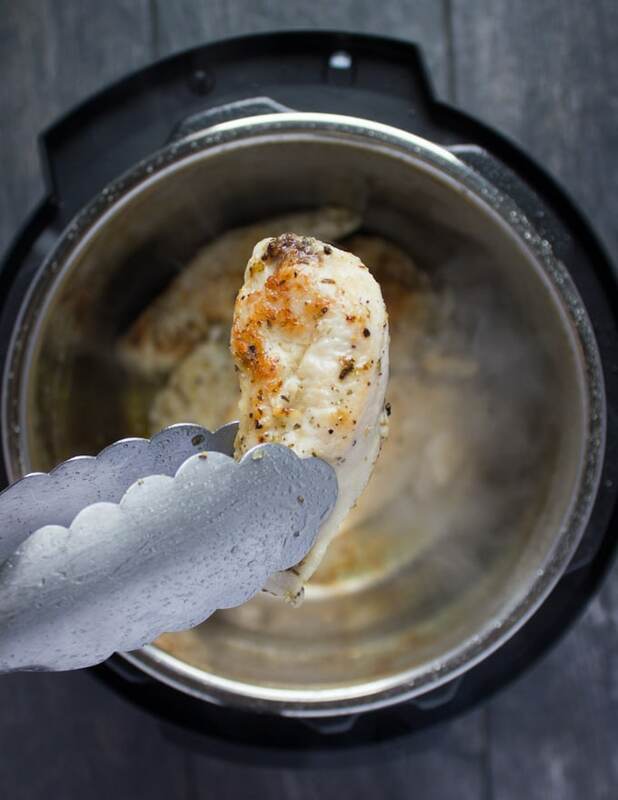 You can certainly skip the searing and cut up your chicken into cubes rather than strips, adding all ingredients together in the pressure cooker. I feel this tiny extra step makes a world of difference! After chicken is seared, removed it and place it on a plate. In the same pot, add garlic and veggies giving them a quick stir. Now the pasta and water, along with some cream and salt go right in. Exactly 5 minutes later in the instant pot pressure cooker, you can happily say dinner is served. It’s that simple. And guys, it’s SO GOOD! 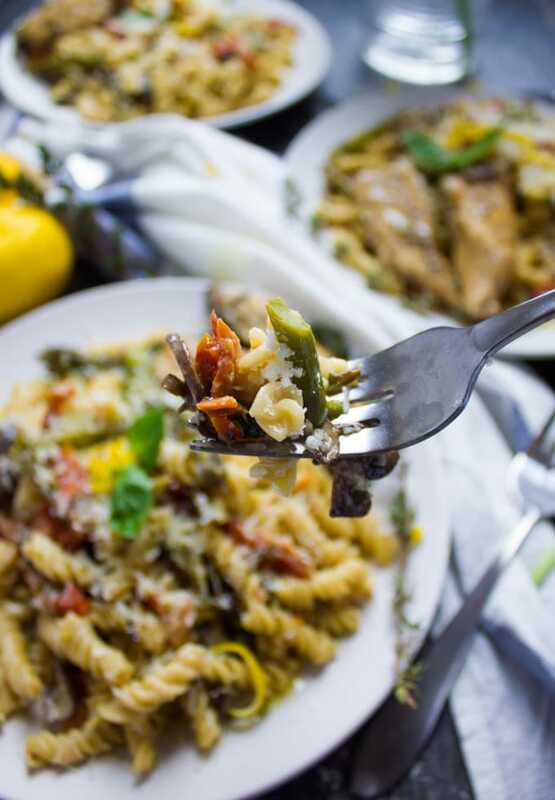 Another thing I love to do is add some fresh basil, parmesan and lemon zest once the creamy chicken pasta is ready. While it’s optional, this last burst of herbs, lemon, and Parmesan cheese really add that special something! Some red chili flakes and a pinch of black pepper are like icing on the cake. 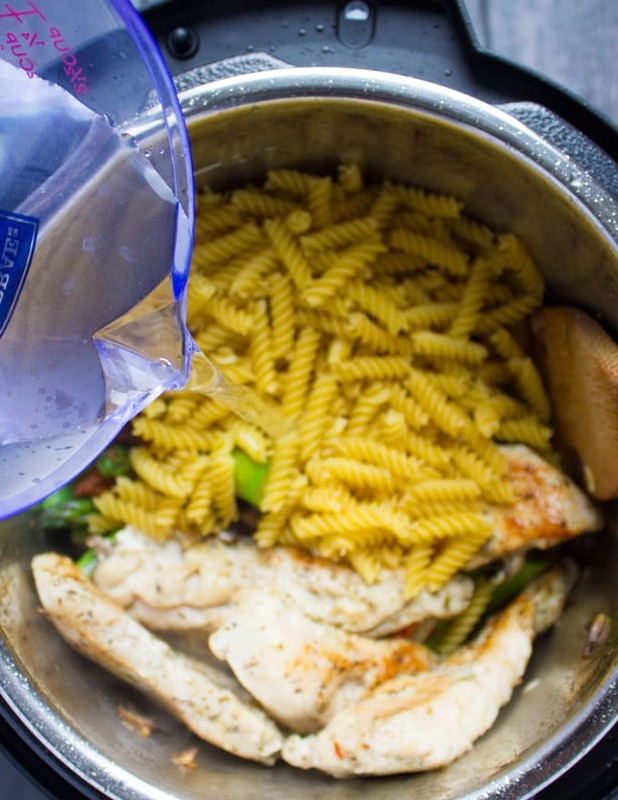 For the record, this one-pot chicken pasta recipe can be made without an instant pot or pressure cooker. However, it will take you 20 minutes instead of 105, which is still awesome! 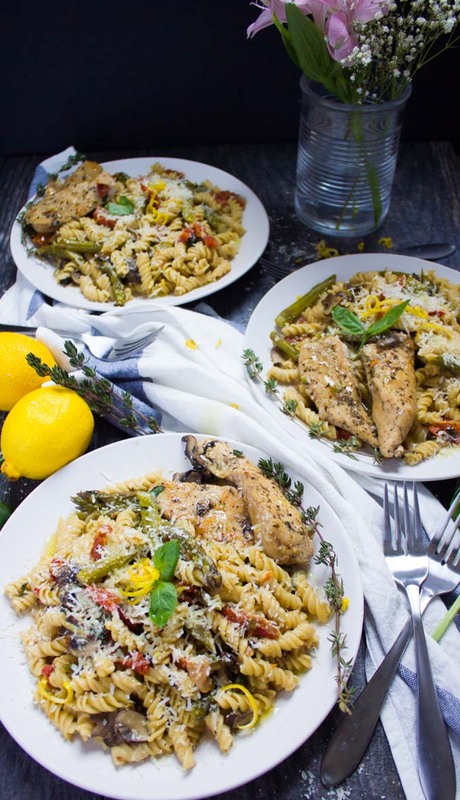 If you’re looking for an easy weeknight dinner, this one-pot chicken pasta is the one! You’ll love the convenience and savings (time, cost and energy! ), the ease and flexibility of ingredients you can play with. And you’ll LOVE yourself for making something so yummy in a few short minutes! 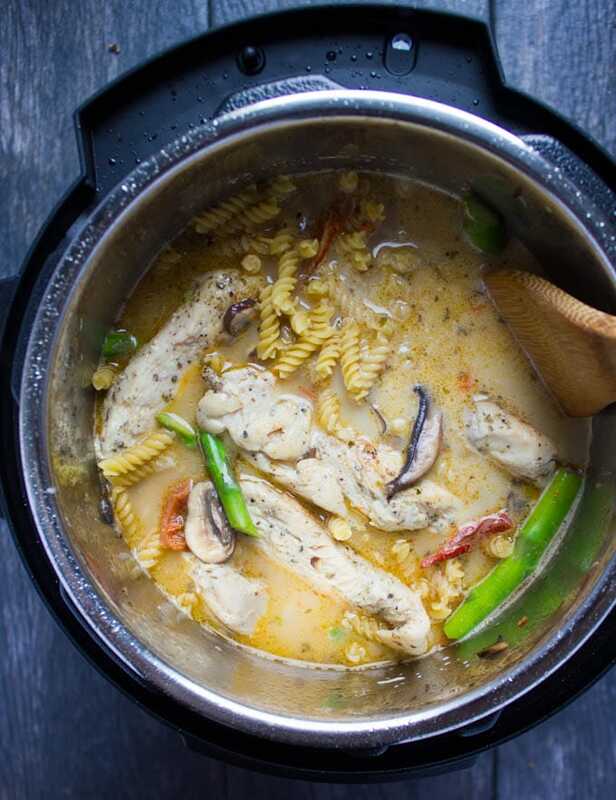 For the record, this one-pot chicken pasta recipe can be made without an instant pot or pressure cooker, but it will take you 20 minutes instead of 105, which is still awesome! 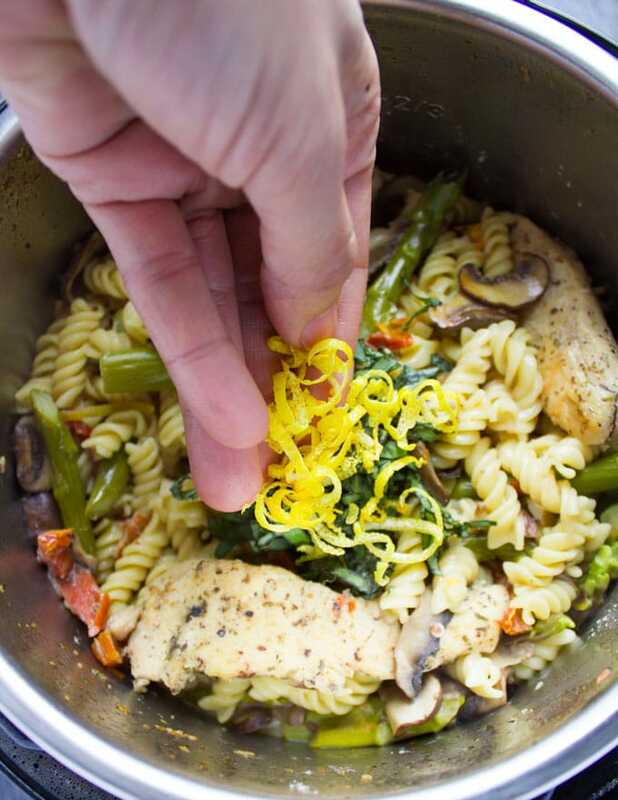 I used fusilli pasta, but you can go with any kind of pasta that fits into your instant pot easily. 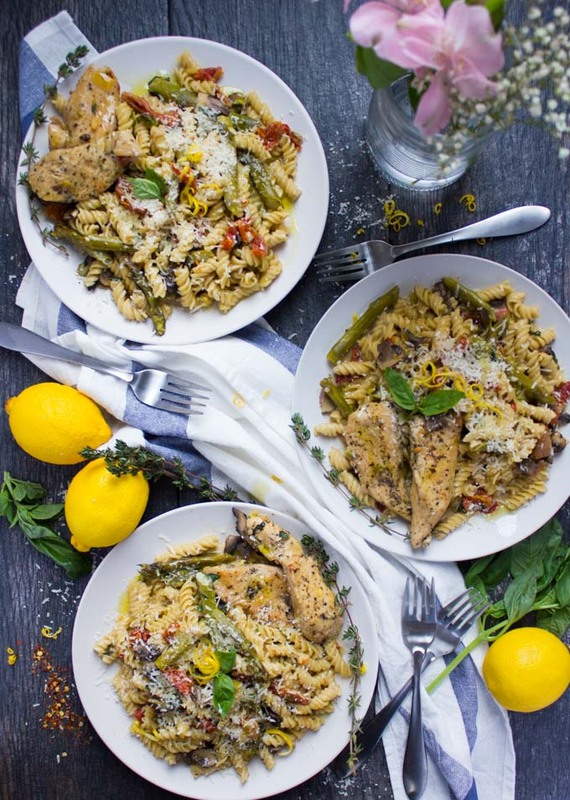 To take this easy meal to the next level, I finish off my creamy chicken pasta with fresh herbs, lemon zest and plenty of grated parmesan cheese! 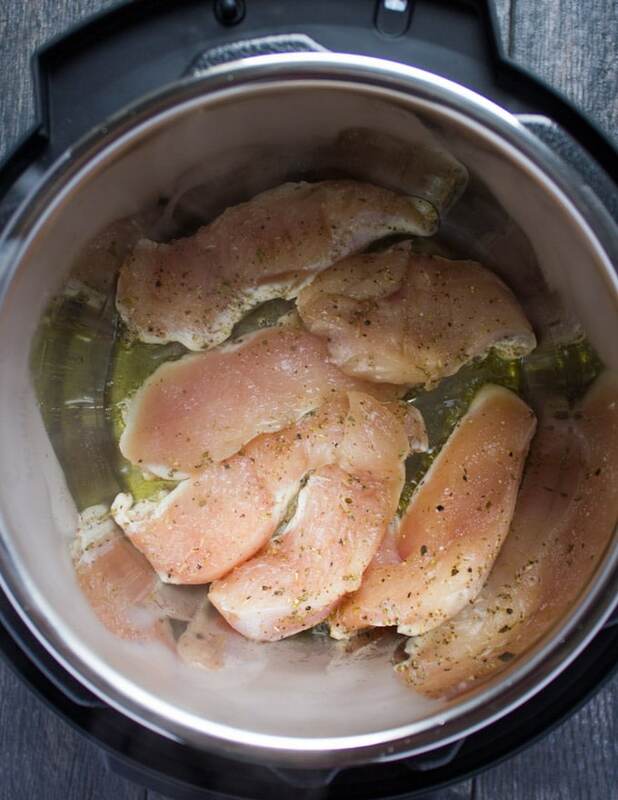 Preheat the olive oil in your instant pot, pressure cooker or large 5-quart pot over high heat. Season the chicken with the remaining ingredients and toss it well. Start by searing the chicken for 1.2 minutes to 2 minutes on each side until it’s lightly golden and the chicken shrinks to seal in all its’ juices. In the meantime, prepare the veggies, pasta, and water. Remove the chicken into a plate and to the same pot, add the veggie ingredients and sauté them for 45 seconds until the garlic is fragrant and veggies start to wilt a bit. Add in the pasta, the seared chicken strips, water, cream, and salt. Adjust your pressure cooker/Instant pot to exactly 5 minutes ( for spirals, bowties, penne and similar size pasta). Once ready, add in fresh basil, lemon zest, Parmesan cheese, some red chili flakes, and extra salt and pepper if you need.